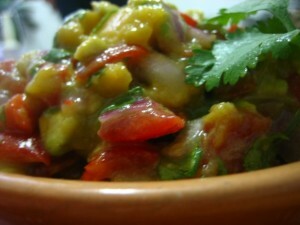 Avocado Mango Salsa - Kosher In The Kitch! Avocado Mango Salsa - Kosher In The Kitch! I prefer mixing the mango, tomatoes and avocado first. And feel free to experiment! You can add a small jalapeno pepper, or a can of baked black beans, or more garlic if you want to. I used lemon juice since I didn’t have a lime, about half of a large lemon, and it worked out wonderfully, since I like my salsa to be on the tangy side.